ACDSee Pro 5 is the fifth instalment of ACD Systems tagging and editing program, which is designed to improve the photographer's workflow and give them an easier life. 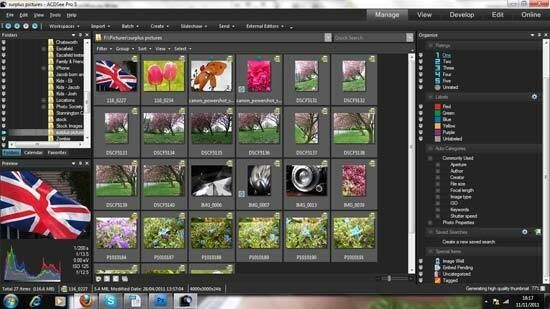 This new software tool aims to include everything for the post-processing of your digital photos. New features include a smart sharpener, split toning, dodge and burn, digital effects, a new tagging option involving colours, batch export and removal of metadata. Priced at £150 / $240, can ACDSee Pro 5 compete with the multitude of similar programs on the market today? 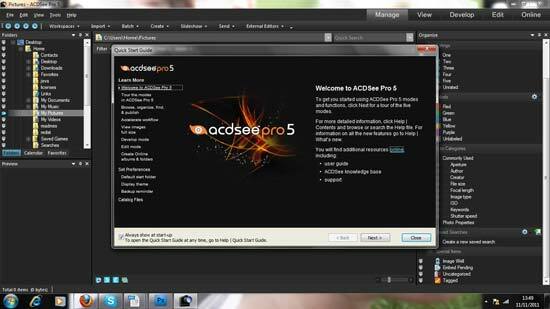 Installation of ACDSee Pro 5 is very fast, although on the website, once the activation code has been input, we had to register and then type in a verification code that was emailed to us. Despite the extra security, it doesn't take that long to get through everything and we were opening the program around 5 minutes later. 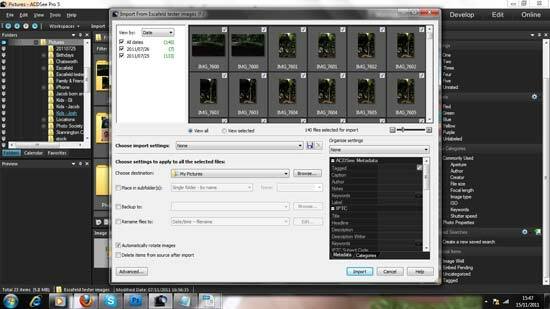 In a similar way to Lightroom, ACDSee Pro 5 is laid out in different sections: 5 to be precise. The layout of all sections is simplistic with no large flashy icons. Instead, ACDSee have opted for text and plenty of it. In the Manage section, which is the first one that opens up, to the left is the navigation system and although it's reminiscent of opening My Computer on Windows, there's a nice white band striking through the selected folder. To the right are a number of organisational options such as number ratings for importance, coloured labels as well as metadata. 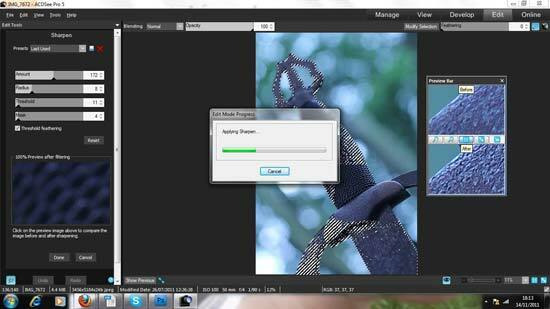 After loading your pictures in, hovering over one will bring up a small preview of it. In the bottom left corner is the first picture or subsequent selected pictures and their corresponding histogram and EXIF data. Switching to the View section brings up all the pictures as small thumbnails along the bottom and the selected picture in an ultra large window. There's a small, very sensitive slider in the bottom-right to zoom in and check focus. Next to the slider is a number of zoom settings that go up to a whopping 10,000%. There's a 1:1 button and fit to screen. There are also a few options in the bottom left corner of the preview window. Simple editors such as rotate and scroll are available as well as setting an external editor. 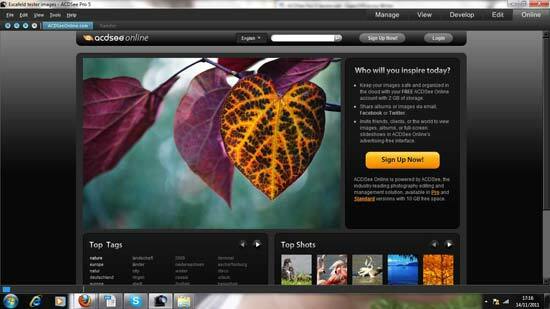 Once you've checked the focus of the pictures, you can add them to an image basket. Any of these checked images then line up in a thumbnail gallery along the bottom of the screen. Opening the Develop section is like opening Adobe Bridge. It's laid out differently (there are three tabs at the top for Tuning, Detail and Geometry) but all the features are there such as white-balance correction, lighting, split tone and curves. 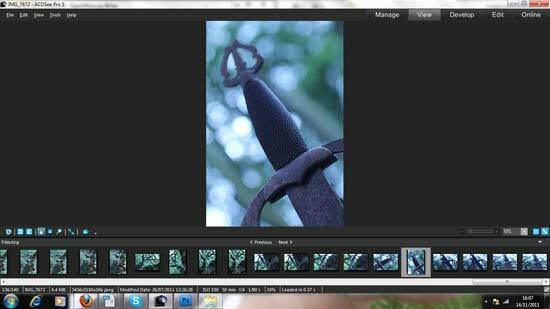 You can also do an all round clean up with the General tab that houses exposure, highlights and fill lights, contrast and vibrance. The sliders are sensitive but not overly so. The adjustments they make are very sympathetic to the picture. There's also an automatic setting that you can activate by either clicking in the picture or sliding the pointer depending on the action you're performing. 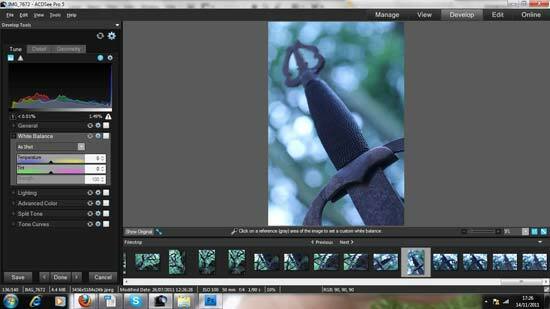 White-balance will also sample from any point in the picture that you click on. 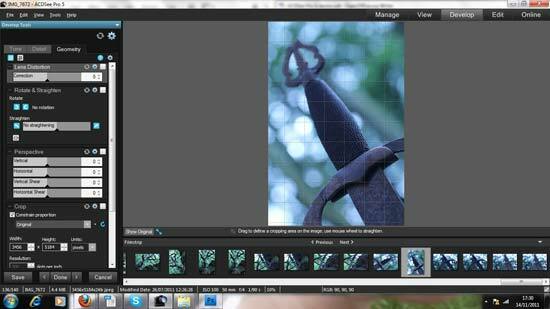 Flick over to the Detail tab and here you can sharpen, remove noise and reduce chroma. To say that the sharpening system in the Detail tab is sublime is putting it gently. In fact, we're going to use this for all our sharpening in the future. As well as the amount, radius and threshold normally seen in Unsharp Mask, there's also a Mask option which increases the intensity of the sharpening in a similar way to adjusting the opacity on a layer. 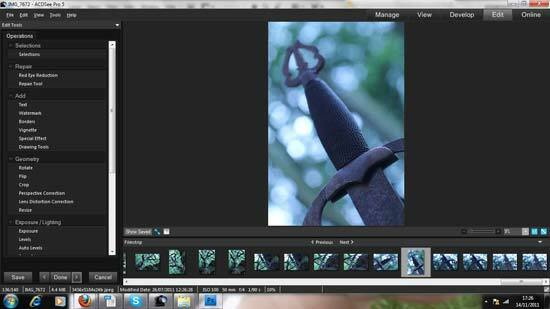 Once the image has been developed, you can move onto the Edit screen. On this page you can do more stuff that's available in a main editing suite such as dodge and burn, colour balance, levels, and curves. We thought that this was getting strung out - going through all the different sections - so we were relieved to see that the Edit page has sharpening and noise reduction here too. The final Online section sends you to an internet site that allows you to upload your pictures to ACDSee's secure server and it allows you 2Gb of space for free.